A digital design publication created and maintained by Case. Designreform is a source of information for the integration of design and technology. 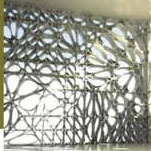 Designreform publishes tutorials and explorations in parametric modeling with software such as 3ds Max, Revit, Maya, and Rhino. There are RhinoScript and Grasshopper samples. Excellent blog on work with Rhino and architecture. Spanish and English. A great collection of resources and case studies from around the world. A great collection of scripting sites from around the world. A page dedicated to programming in RhinoScript. Kokkugia is an international design practice based in London and New York that operates through design, research, experimentation, and teaching. www.kokkugia.com - This page is dedicated to programming in RhinoScript. The goal of Archinect is to make architecture more connected and open-minded and bring together designers from around the world to introduce new ideas from all disciplines. Algorithmic design is used to develop systems of a high degree integration and variability of the space inside a stadium shell.